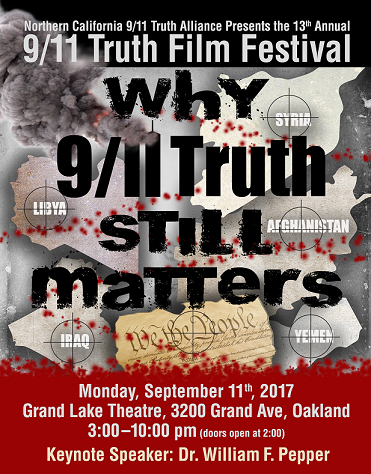 Sixteen years after 9/11, the Northern California 9/11 Truth Alliance will hold its 13th Annual 9/11 Truth Film Festival at the Grand Lake Theatre, 3200 Grand Ave., Oakland, Calif., on Sept. 11, 2017, from 3 p.m. to 10 p.m., featuring the renowned attorney and author Dr. William F. Pepper as keynote speaker, and seven films on the cutting edge of research into the tragic events of 9/11/2001. Keynote speaker Dr. William F. Pepper is a human rights lawyer most known for his defense of James Earl Ray in the trial for the murder of Martin Luther King, Jr. Pepper is also the chief attorney for Sirhan Sirhan and has worked for over a decade to get a ruling for a retrial for the murder of Senator Robert Kennedy. Pepper has represented governments and heads of state, and has appeared as an expert witness on international law issues. In his 2016 book "The Plot to Kill King: The Truth Behind the Assassination of Martin Luther King, Jr.," Pepper reveals dramatic new details of the night of the murder of Martin King, the trial, and why Ray was chosen to take the fall for a government-sanctioned assassination. His findings make the book one of the most important of our time—the uncensored story of the murder of an American hero that contains disturbing revelations about the obscure inner workings of our government and how it continues, even today, to conceal the truth. Bill Pepper has also been active in the 9/11 truth movement, including giving a keynote address at the historic 9/11 truth conference held in Chicago in 2006, and working closely with a distinguished team of lawyers now assembling a 9/11 legal strategy. Additional speakers include authors and radio show hosts, Anthony Hall, Kevin Barrett, and Mickey Huff, Director of Project Censored. Engineers for 9/11 Truth answer the question: Why Revisit 9/11? The Northern California 9/11 Truth Alliance is one of the first 9/11 truth groups in the country and has been organizing events, rallies and film festivals for over a decade. The group’s mission is to seek and disseminate truths about the terrible crimes committed on September 11, 2001, exposing gaps and deceptions in the official story. Can you please elaborate on which team of lawyers William Pepper is working closely with? kawika on Tue, 09/05/2017 - 9:55am. Carol Brouillet on Wed, 09/06/2017 - 10:47am. TomT on Wed, 09/06/2017 - 8:43am.